I have had do some research lately so i rejoined Ancestry.co.uk This time i just took out the Essentials membership. This cost 10 pounds for one month. Was it worth it? time will tell but i was going around in circles today with out getting any where. The imformation that i wanted i found on two free sites. Familysearch.org and BMD Lancashire. Both are sites that i have recomended and the links are here in older postings. I wanted to have a look at how much Ancestry were charging for copies of BMD Records as i wanted to order a Marriage Certificate . Well ,here are the prices , for a standard delivery charge it was 20 english pounds and for the express delivery charge it was 40 pounds. I have also come across the 40 pounds fee on some other Genealogy sites. Renee Hartley was born in 1930. The middle child of three girls born to Enos Hartley and Edna Hartley nee Dole. Edna and Enos were married in 1928 in Burnley, Lancashire. 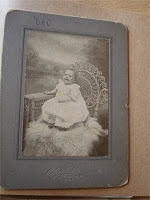 Enos had been born in 1906 at Haslingden, He was the middle child born to Samuel and Sarah Hartley. Unfortunately, Enos was run over and killed in 1942 in Coventry during the black outs. Renee remembers her Grandparents as being strict but very kind. They lived in Nelson, Lancashire, in a small Terraced house that looked on to Pendle Hill and the surrounding countryside. Samuel had been born in Bacup, Lancashire. 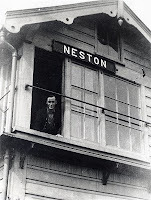 He was one of four children born to John Hartley and Susanna Hartley nee Standing. George and Ruth Lewis her parents had both been born in the same area. George born in 1865 at Penymunydd and Ruth born in 1867 at Hope, Flintshire. During the 1st World War most of the male population were involved in fighting for their country.The women who were remained behind on the home front were employed in jobs, that were normally filled by men. Sarah Hannah was made Station Mistress at the Burton Point Station, Burton on the Wirral. Needing somewhere local to live, Sarah Hannah found accommodation with a family who lived in Neston. It was while she was employed as Station Mistress that Sarah Hannah met her future husband. Thomas Cottrell was from a local family in Neston. He was a guardsman on the train line, an occupation that kept him away from the Trenches. "I give and bequeath my holding in Drumnaquoile and any chattels thereon and anything I may die possessed of to my said Nephew Hugh McMullan, subject to him paying my debts, funeral and testamentary expenses, he having already advanced me upwards of £30, and subject to his paying my Nephew Patrick Connor of Workington who was injured in Works £10 as a legacy I leave to him." Will was dated 8th August 1904 and it was signed by Patrick himself in his own hand. The Farm of Land in Drumnaquoile was held on a yearly judicial tenancy and was 6 acres 0 roods and 20 perches statute measure. of 1901. The elder brother to Allan 11 and Michael 9. The two girls Mary and Ellen were 19 and 18 so there was a big age difference between him and his older brothers. Hugh 30, Patrick 28, William 25 and James 21, were still living at home even though they were adults. Sometime between 1901 and 1910 John and Mary McMullen returned to their homeland of Northern Ireland. Michael returns with them but its unclear if Daniel goes with them too. Next Daniel is enlisting in the Royal Lancs at Barrow in Furness, number 14846. Source citation here is The British ww1 Pension records 1914-1920. His father John McMullen had died in Northern Ireland in 1910 and his Mother Mary had died in Northern Ireland in 1913. Margaret O’Prey/Prey was born in Ballymagreeham, under the mountains of Mourne. She was one of nine children born to Patrick William O’Prey and Margaret McEvoy. The family came from a farm that was at the foot of the Morne Mountains . This quotation was made by the grandson of Margaret. No doubt he had been reprimanded by the formidable lady. Margaret had spent some of her childhood living with her fathers brother in Durham, England. It was here that she attended a private school. At a time when schooling was not compulsory in Ireland this would have been considered unusual. Margaret’s grandson also remembers that his grandmother was always writing. What we can only imagine and wish that we could recover the thoughts that she put down on paper. He would live an eventful life over two continents and two centuries. The first records we find are of his christening on the 8th of August 1850 at St Peter’s Church in Liverpool. He was the first child born to William Frederick Penington and his wife Ann Penington nee Sutton.William and Ann had married in 1849 at St Philips, Liverpool. We next find Frederick William Penington in the 1861 English census. Frederick is 10 years old, he has two younger sisters Elizabeth and Litchi .The three children are living with their father William in Everton, Liverpool. William is listed as being 36 years old and a boarder at that address in Everton. There is no mention of a wife for William or a mother for the children. The census records William as being a widower. The Occupation for William here was a Pilot In those days it was a Pilot of the waters and not the sky. On the 19th September 1945 Eugene McMullan left Belfast, Northern Ireland on route to London. He was 22 years old, strong having been used to farm work and eager to make his fortune. It had all come down to the toss of a coin, heads would be London, tails had been New York. He had waved goodbye to close friends as they sailed for the big apple. Eugene had been born on the 15th April 1923. He was one of nine Children born to Michael and Elizabeth McMullan of Drumnaquoile, Castlewellen. Michael had been born in Harrington, Cumberland. He had moved to Ireland when his parents had returned to their homeland. Here, he had met and married a farmer's daughter from Dunturk. Lizzie Laverty had been 20 years old and Michael 22 when they had married at Drumaroad Catholic Church. John McMullen was born in 1848 in Downpatrick, Down, Ireland. Mary his wife was born Mary Connor in 1851 in Clough, Loughinisland, Down, Ireland. Clough was a town land of 396 Acres. The first five boys they had were born in Down, Ireland. John was the first, named after his father. He was born on the 20/09/1868. Then came Hugh 1870, Patrick 1873, William 1876 and James 1880. The family packed up their possessions and moved over to Cumberland in England some time between 1880 and 1881. John McMullen and his family were found in the 1881 English Census. The family were living at 169 Sibsons Place, Harrington. In the district of Whitehaven, Cumberland. John was 33 and Mary was 32. John's occupation was listed in the census as a labourer. I have rediscovered Amazon.If you are a book reader then Amazon is like a big on line toy shop. The good thing about them is, if you are looking for a book that is out of print. They may have a good used copy for a fraction of the price. This is often the case with Genealogy books so take a look here, and make your own book wish list. Now is a good time to take advantage of the free offer that Ancestry has on at the moment. It is available on all three sites, Ancestry.com, Ancestry.com.au and Ancestry.co.uk. They are all offering a 14 day free trial. You need to submit your credit card but if you do not want to continue after the free period, its easy to cancel your details before your 14 days run out. This is an ideal time to start looking for your English Ancestors. Kendal, the Gateway to the Lakes. The last post about Cumberland, which is now called Cumbria reminded me that Kendal played a big part in my life. My eldest two children were both born in Kendal at Helmechaise Hospital. This site is a valuable source of information as its gives a view of Kendal's history and kendal today. Researchers of Cumberland and Westmorland will find it of interest. The Cumberland and Westmorland Archives is available for free search online. Parish records are available to browse from 1662. This site also has links to local record offices, Kendal, Carlisle, Whitehaven and Barrow in Furness. This site will be of interest to researchers of English and Irish family history. Your one stop shop for Genealogy but is it? Well yes it can be. Ancestry.com is the one for you if you are in the United States, or you are in England but have part of you family line in America. Just to make sure you get the best price if buying world membership,check rates first on a money converter. See which is the best value for the pound verse the American dollar. So now you have joined the biggest Genealogy site in the world. Make the most of what the site has to offer. The worst thing you can do is to get bogged down with searching for one person. In the beginning its like one big jigsaw puzzle, if you spend all your time looking for one piece you will not progress. So if you hit problems ,stop and record what you know to date and move on to another section. The Boston newspaper ran a column with advertisements from people looking for friends or relatives who had left Ireland for the United States. The web site is sponsored by the Irish Studies program at Boston Collage. Raymond's County Down Website has been made to help people researching Down. It concentrates on the areas of Banbridge, Dromore, Kilkeel and Mourne. There is great deal on information on this site. Hope you enjoy listening to the Irish music. Which is the best paid site, Ancestry or Genesreunited ? Can anyone help me with this? I have always used Ancestry.com and Ancestry.co.uk. So the thought of building a family tree with a new company does not appeal to me.I joined Genesreunited sister company 'Friendsreunited' when it became popular about six years ago. When they first started 'Genesreunited' i joined that too but never went any further adding people to the site as i was busy with Ancestry. I know people that use Genesreunited but they have never used Ancestry. So which one is the best and Why? If you have an opinion please leave a comment and share your view. Its my daughters birthday in a couple of weeks time and i have been researching on the net for some gift ideas. I have seen lots of things that i would like that no one would think of buying. Number one choice would be a years membership at Emerald Ancestors. Number two choice would be a years full world membership at Ancestry.com .Number three choice would be some look ups at Emerald Ancestors. My daughter turning 22 would not not like any of these things. I found a great site though with gift ideas that she would like. When you were beginning your family tree, you gathered together all the information that you could find. Were you lucky enough to find an old letter? Old letters can set a scene from the past and give us a real insight into the writer's life The letter or parts of the letter can become a feature on your family tree. The Irish Family History Foundation has around 40 million of Irish records indexed. Church Baptisms, Marriages and Deaths. It is free to search the index's here you can narrow down the lists until you find a couple of records that look like they may be your Ancestors. From here if you want to view the records then they charge 4 pounds to see one record or if you are a paid member of the Foundation,the charge per view will be 2 pounds. The census not only tells us about our own family history, it records the history of well known people. I have always had a fascination for the Bronte sisters. This may be as the Yorkshire village where they grew up, was only 9 miles away from the Lancashire mill town where i grew up. I have many memories of visiting Howarth, as a teenager and the last time as a parent. When i was about 14, my sister and her boyfriend and i walked to High Withens from the village of Howarth. It must have been in January as the ground was covered in snow.It was absolutely freezing.High Withens is thought to be the house where Cathy and Heathcliff lived in 'Wuthering heights'. Ruins was all that remained of the house. We sheltered in its walls and warmed ourselves on hot soup. The Bronte sisters, Charlotte, Emily and Ann were three sisters who would become the most famous sisters in English literature in England. This is a free resource for Australians who have residence in Australia. Australia was populated in the beginning with settlers and convicts from the British Commonwealth. There must be a high percentage of today's residents who have English Ancestors. The National Library of Australia has many different Collections that are available to search online. One example is the collection of Australian Newspapers from 1803 1954. So what do you do? you need someone to help you, maybe someone researching the same family or the same name. If you belong to Ancestry there are a couple of things that you can do. Go to the family tree section on Ancestry and type in details of your Ancestor. Look through the results for someones tree with you Ancestor listed there. Try different combinations like the name of a brother, uncle, father, sister, mother. Take note of who owns the family tree .If it is a public tree, then you can look through it to see if you can make a connection. If the tree is private then you will be able to e-mail them through Ancestry and ask for further information. Ancestry also have another section where you can look for people who are researching the same Surname and make contact with them. Pay Genealogy site, is it worth the money? I have left the biggest until now. Ancestry.com, Ancestry.co.uk and Ancestry.com.au Is it worth the money? Well yes and no. If you only have a go at family research a couple of afternoons a month, then you would not get value for money. If you are going on the site daily then yes, it is worthwhile having membership. If your ancestors lived in England and then moved to America, then i would suggest having world coverage. If they were just from the USA then just have the coverage for America. If they were from England and moved to Australia I would suggest world coverage. You can pay monthly and cancel at any time. There are two things that i find disappointing with Ancestry. When doing a search for somebody, the first couple of results look like they could be the person. Then there are long lists of searches that are way out of the information that you have submitted.